A few weeks ago I mentioned that I was going to try the Pot Maker for starting my seedlings indoors. I am happy to report that it is a great success, although the lack of sunlight caused a few seedlings to get leggy. My tomatoes and celery are looking great though. I'm excited about this little gadget because I won't have to run around looking for peat moss pots anymore. Perhaps I'm the only person who has had trouble with peat moss pots breaking down, but they just seemed to take too long to compost. However, I was afraid the newspaper which I used with the Pot Maker would compost too quickly, but as you can see from the photo, it is doing nicely even though I have been generous when watering, often soaking the bottom of the cup. Despite the amount of water I was able to move it around with out any rips or tears. To make a pot, cut a strip of paper about 3 1/2 inches wide and at least 10 inches long. Roll it around the large portion of the Pot Maker in order to make a tube (do not remove it yet!). Be sure to resist the urge to wrap the newsprint tightly around the form because it will make it difficult to get the pot off at the end. You want it loose enough that you can slip it off without crushing the newly formed pot. Next, push the larger portion with the newspaper down onto the small circular press, applying pressure. Finally, remove your paper cup and you're ready to plant! It's that easy. In fact, you could probably use a small can or baby bottle for this, but I have to admit, this tool does make it easy. I was able to make a bunch of these in just half an hour. I'm not sure it would be quite as easy with just a can. One other little tip that might be helpful, but not absolutely necessary. I added just a small bit of glue from a glue stick at the top to hold the paper together at the top. As you can see in the photo below, it has pulled away just a bit and since this bothered me, I went ahead and glued it down (only necessary for neat freaks). You can purchase about 8 peat moss pots for around $1.25 or 112 pots for around $17.50 without tax. Perhaps you can even find them a bit cheaper. But compare that cost to the one time investment of a Pot Maker for about $18.95 (see my Amazon Store in the left sidebar). Even if you are just a small scale gardener, it could easily pay for itself in one or two seasons (and you can't make a peat moss pot look very cute for gift giving). Only a couple of things more are needed to make this little item perfect... train the kids to make them and remember where you put it at the end of last summer! I finally did it. After years of wanting to keep bees, I bought a bee suit and took a basic beekeeping class. I figured that if I hated the class or got too squeamish, my curiosity would be satisfied and that would be the end of that. However, I was totally fascinated! Bees are unlike anything else I've encountered because of their social structure and habits. So on the ride home, rather than convincing myself I couldn't really do this, I began to solidify my plans for getting started. You may be wondering why anyone would want to do such a thing (unless they were a commercial farmer or a bit off their rocker)? Well, I'm not sure I can even put it into words. I can spout off some of the benefits of keeping bees, such as honey and wax production or pollination of plants, but it doesn't really explain why I personally would feel the need to be involved in this venture, except to say I love the whole farm stuff. I find it relaxing despite the work. Actually, the work is a good kind of labor that makes you feel like you've really accomplished something at the end of the day. I admit, the idea of my own honey is a strong motivator, but it honestly it isn't the only reason I've been drawn to keep bees. Anyway, I got some friends, drove 2 1/2 hours to a class (one way!) and met up with a bunch of other newbies to the world of bees. The turn out was huge with 50 attendees; the biggest new group ever for the Beekeepers Association of Southern California. I would have loved to interview each one of them to find out the reason for their interest in bees, but there was so much to learn and so little time! Besides learning all the basics from some long time Apiarists, but we got to go to the hives and check out what was going on with the bees! Okay, I confess I was nervous. I had no idea how I would react if I got stung. Would I swell up, have an anaphylactic reaction, or be in so much pain I couldn't finish the class? As my interest in beekeeping has grown, my fear that an allergic reaction would stop me from doing this has also grown. Happily for me and the bees, they were in a good mood and I left without any unpleasantries. I got to meet some queens as well as her subjects, see the honey, view the brood, observe some hatching from their comb, and hear the finer points of bee lore. 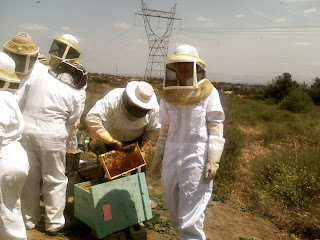 All in all, it was a lovely day that left me anxious to get my own hive started. Waiting to meet the queen bee! I hate to bore you with too many posts regarding bees, so I'll try to keep it to an occasional update and hopefully it will be interesting enough that I won't run you off! But with all this excitement, I just have to spread the enthusiasm around a bit. Who knows? Maybe some of you just might join me! There are so many books out there on gardening and it seems that they all say about the same thing, just in a different way. Occasionally, you'll find one that introduces some revolutionary idea or thoughts. Or perhaps you'll come across one that is just a joy to read because of the author's style, the layout of the subject, or the lovely photos (I love photos!). But rarely do you find a book that works hard for you. 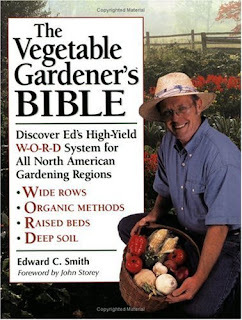 The Vegetable Gardener's Bible, by Edward C. Smith, is definitely one of those books! Ed Smith has compiled some really pertinent information for the home gardener in a easy to reference book that you will refer to again and again. The topics in the Table of Contents sound typical, but the information in each chapter is extremely practical. In chapter one he explains his W-O-R-D system for wide rows, organic methods, raised beds, and deep soil in order to harvest a high yield. Chapter two covers purchasing seeds and how to select them, companion plantings, and crop rotation. And all of this is explained with pictures, drawings, charts, and well written descriptions! If you are like me, and you need to extend your season or get an early start indoors, then Chapter 3 is very helpful. And if you're not sure which kind of plant cover to use, Ed shows you several as well as some great trellis ideas. Other chapters include composting, storing your harvest, watering, soil pH, disease and pest control, and earth worms in your garden. But my absolute favorite part of book is the section on "Getting To Know What You Grow". I invite you to go to my bookstore on the left sidebar, click on the store, shop around, and purchase The Vegetable Gardener's Bible. Somewhere along the way women have stopped wearing aprons. At least is seems that way. Our moms used to always wear one and everybody had several so that if one got too dirty another one was ready at hand. I haven't researched this, but I'm guessing that aprons began to lose their panache when the feminist movement picked up momentum during the 1960's. I don't remember seeing hardly any aprons on women by the late 1980's. I know they were out there, being worn by those few who refused to bend to the fads of the time and who knew a good thing when they had it. But the apron did not hold the same position it once had in the lives of women. Today if you asked a young woman the purpose for wearing an apron, she would probably just state the obvious - to keep your clothes clean. And she would be right, but it would not be a complete answer. It wouldn't tell about all the times aprons were used for holding catch-all items, gathering eggs, wiping tears, collecting peas from the garden, drying a dish, or cleaning a surface. Rumor has it that Susanna Wesley, used it for a prayer room. As a mother of 19 children, including John and Charles Wesley, she would flip it over her head in order to pray as children ran around her. After several trips to the dry cleaners recently to remove oil spots from some shirts, I decided to don an apron. Interestingly, I felt transformed, empowered, energized! I wasn't just a lonely mom in the kitchen anymore, but I imagined myself as part of a sisterhood. It was if I had a new status among women. And I was ready to work. In fact, at the end of the day, I was shocked at how reluctant I was to take it off! Pehaps you, too, wear aprons and secretly feel fabulous! It's time to come out of the closet (so to speak) and wear it with pride. No more will feminists make me feel ashamed to be seen with fabric tied around me in beautiful patterns. I dare them to try an apron on! This one I wear the most, by April Cornell. I love the ajustable button at the neck. I'm not sure that I can do justice to a post about the Passover from a Christian perspective. It is so full with meaning that I find myself in awe every time I go through the ceremony. To express all of it would be difficult. It's like watching a movie filled with important dialog that moves so fast you have to watch it at least twice to get it all. So I guess you really need to experience a sedar more than once. However, let me try to at least give you an introduction that will perhaps encourage you to pursue this experience next year. The first Passover was celebrated the night that God sent the tenth and final plaque on Egypt during the time of Moses. The Israelites had been captive for about 400 years and the Pharaohs of Egypt used them as slaves making bricks and building. They longed to return to the Promised Land and awaited a deliverer. God used Moses. On the night of the final plaque, God instructed Moses to have the Israelites kill a lamb without defect (representing the perfect lamb to be sacrificed for our sins - Jesus Christ) and spread the blood on the doorposts of their dwellings (representing our sin covered by the blood of Christ). The meal that night was to consist of roasted lamb, bitter herbs, and unleavened bread because they would be leaving in haste after the death angel passed and Pharaoh let them go. Later that night, the Death Angel did come and all throughout Egypt, he slew the first born in every house without the blood of the lamb, but he passed over those that were covered by the blood. You can read about this first Passover in Exodus 12 where God gave Moses and Aaron the instructions, along with the command to practice this ordinance every year in order to remember what God had done (like we remember during the ordinance of the Lord's Supper). The Jews were still practicing this when Christ came to Jerusalem for His final days. In Luke 22:15-16, He told his disciples that "...I have eagerly desired to eat this Passover with you before I suffer. For I tell you, I will not eat it again until it finds fulfillment in the kingdom of God." The disciples did not realize at the time, but Jesus was the passover lamb! He was to be the fulfillment of all that they had done for so many, many years. Christ told his disciples to do this in remembrance of Him. 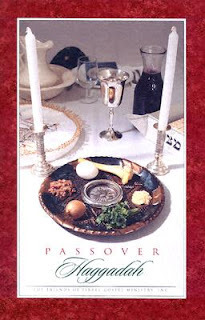 Today, the Christian church continues to do an abbreviated version of the Passover Sedar whenever we take Communion. I believe that it would behoove us to practice the entire Passover Sedar once a year to remind us, fully, what God was communicating when he established the Passover centuries ago in Egypt. And when we get to heaven, we will have the final fulfillment of this ordinance when we celebrate the Wedding Feast (Rev. 19:6-9). Now that we have a little history (and I have holy goosebumps), I will share with you just a bit about our own passover. You really need to start by purchasing a good Christian Haggadah. It will guide you in items you need for the sedar plate, history, and the feast itself. These Haggadahs are based on Jewish custom, but incorporate how Christ is the fulfillment. I really like the Haggadah from The Friends of Israel. Purchase enough for your family and one other family. If that is too expensive, at least get one for every other person and readers can share (consider this purchase a donation to a great ministry!). You will need a few recipes such as haroset and I like to serve Matzoh Ball Soup. We serve a roasted meat such as chicken (Jews will not serve roasted lamb because they are waiting for the temple to be rebuilt in order to make a sacrifice), vegetables, and a fruit salad. Dessert needs to be unleaved, such as angel food cake. 3) a shank bone from a lamb from the butcher ( I keep this in the freezer to reuse each year). The Haggadah will lead you through these items, but it is good to read it through before hand. I also like to highlight the group responses in each book so those who are new know when to read aloud. Also on the table, you will need bowls and towels along with a pitcher of water to wash your fingers or hands, two candles, a white cloth napkin folded so that it has three "pockets" or folds, matzoh, and wine glasses, and a pillow for the host or leader. All this is in the sedar book, so don't worry about remembering it here. I like to have a $5 or $10 bill for the child who finds the aifkomen that is later hidden and found (kind of like a game but with significance). This is a picture of my table before I finished setting it. I had not added the elements to the sedar plate (at the bottom of the photo). Notice the bowl just to the upper right of the sedar plate for washing the hands. Anyway, this is the basic information you need to get started. It sounds a bit complicated, but if you remember that we are not bound by the law and if you goof up on something, just laugh and make a note in pencil in your Haggadah for next year. Our first couple of sedars were a bit bumpy, but we didn't give up. Hey, we're new at this and the Jews have been doing this for thousands of years! Celebrating a joyous passover with family and friends! Most girls have a thing for shoes, diamonds, or pretty nails. I have a thing for beautiful table settings. I adore china patterns, love creative centerpieces, and as of late, I have a desire for cloth dinner napkins. In ancient Rome, various size napkins were used including one that was small, like a handkerchief, to blot the brow during meals due to the warm climate in the Mediterranean. In the early Middle Ages, the napkin disappeared from the table and folks used whatever was handy, even if it meant their own clothing! Later, three cloths were added to the table. The first, called a couch, was laid out for the head of the table. Then the surnappe, was placed on top to designate a place for an honored guest. Finally, a communal cloth hung like a swag from the edge of the table for everyone else to use. 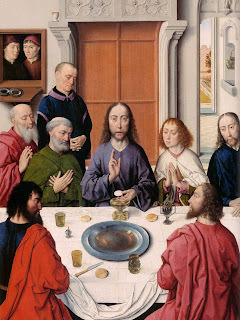 Dieric Bouts painted such a cloth in his work The Last Supper as seen at the right (photo from Web Gallery). Finally, in the late part of the middle ages, it was reduced to the size of a bath towel. Jumping to the sixteenth century, napkins became an accepted form of refined dining. Several sizes continued to be used depending on the type of meal served, whether one was standing or sitting. Remember, utensils were not commonly used, so one ate with his or her hands making a napkin an essential item. But as refined dining gained prominence, the fork was added and thus the size of the napkin was reduced to accommodate just keeping the mouth tidy. By the 18th century it was common to find such items on the tables of all classes. But enough history, I want to talk twenty-first century. I'd like to add that you're really saving the environment if you use cloth napkins, but I'm not sure it's a strong argument. It may save a tree, but the cloth napkins must be washed and will require detergents. Also, I suspect most paper napkins are biodegradable and can be easily composted. On the other hand, many of us use high efficiency washers and safer laundry soaps. Then there is the fact that cloth napkins are made from sources that are quickly renewable, so perhaps it would be a benefit. I could go on and on battling this back and forth. But let's face it. We've lost the art of gracious dining. Our families eat on the run and rarely do families sit down together for a meal. If they do, it probably is only once or twice a week; certainly not the norm. We treat our guests better than our own. Can't we treat both our guests and our family like we care? Wouldn't it be a gift to our family to occasionally set a lovely table just for them, because we love and value them? I've been picking up napkins lately in bunches of 8 or 12. When I find a pattern or fabric I really like, I can hardly resist. (I try to watch for sales and I've considered making some of my own.) Regardless, I find that the napkins stay in the dinning room drawer - waiting, and waiting, and waiting some more. No longer. I'm starting a new tradition. I am going to try to used cloth napkins at least once a week, just for my family! And who knows, maybe it'll catch on. Do me a favor, will you? Add a post and share your thoughts on cloth napkins!